The U.S. economy made impressive gains in the 20th century, but this progress makes it easy to forget a harsh reality: Americans were the victims of disastrous government policies that cost trillions of dollars in wasted resources, created mass unemployment, and kept millions of people in poverty who otherwise would have participated in the nation’s growing prosperity. 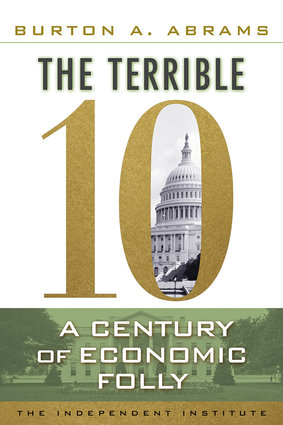 A complete dissection of the 10 most egregious economic blunders of the past century, this work provides the key lessons to help in avoiding such policy mistakes in the future. The Terrible 10 notes that, unlike the private sector, when the governance of the federal government fails, the role and scope of government is usually increased and that politicians from both parties tend to favor short-run benefits for friends while imposing costs on current and later generations. With issues and blame divided equally among Democrats and Republicans, this work stands as a highly readable history of how government economic blunders affect everyone. Burton A. Abrams is a research fellow at the Independent Institute, the director of the Independent Institute’s government cost calculator, and a professor of economics at the University of Delaware. He is the author of An Economic Theory of Lobbying: A Case Study of the U.S. Banking Industry and Return to Animal Farm. He lives in Newark, Delaware.